Today, the Big Screen has updated the Submissions Policy, superseding all previous versions with immediate effect. These new terms have been written as a control of both content and (newly added) advertising terms for submissions to the Big Screen. 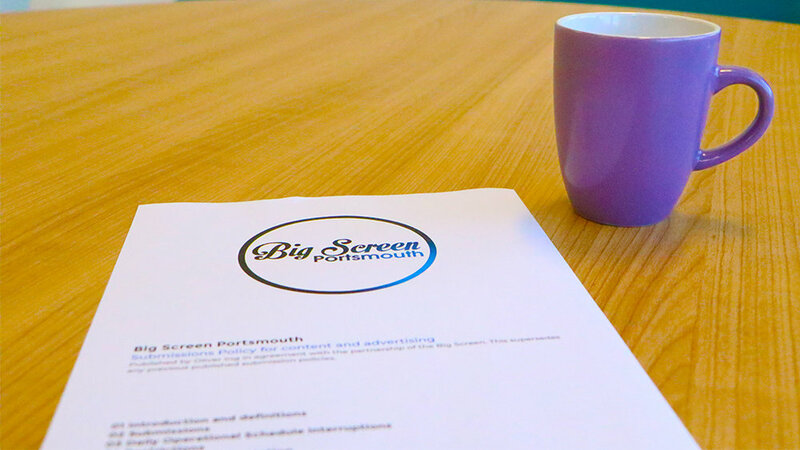 Previously, this documentation was referred to as “Guide to the Big Screen” however, with the many updates now in place on the Big Screen Portsmouth website, the document has reverted back to the official title of “Submissions Policy”. This document has been written by the current Producer, Oliver Ing and has been agreed by the partnership: Portsmouth City Council and the University of Portsmouth relating to all submissions. The document will be made easily accessible across all pages on the Big Screen website and freely for download. Any comments should be made by using this Contact Page where the Producer will respond within 21 working days. Big Screen Portsmouth, Events Team, Portsmouth City Council, Floor 5 Core 4, Civic Offices, Guildhall Square, Portsmouth, PO1 2AL. Copyright © 2019 Big Screen Portsmouth. All rights reserved.